We're hoping to spend a bit more time this year exploring the countryside, historical sites and local food. First stop on that journey was Bakewell in Derbyshire, a day trip that started out as a pudding exploration and ended with us buying a padlock. We like to celebrate our anniversary with a day out and this year, Derbyshire won… It was Sunday and the first really nice day in what felt like forever, so everyone who could get away was out to enjoy the sunshine. The ice cream vans did a roaring trade, the ducks on the river were fed to bursting, and a lot of the local pubs and cafes offered seating outside. Yes, there were people everywhere, but Bakewell is a cheerful place and the mood soon rubbed off. 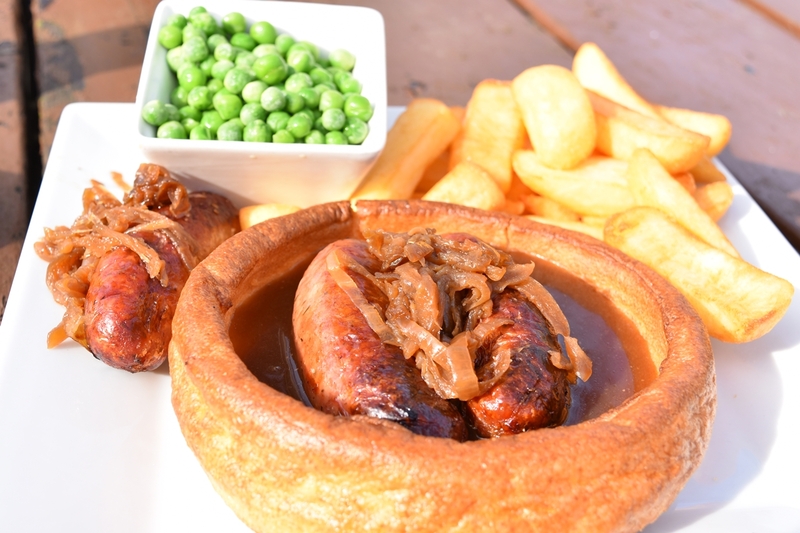 Helped along by an excellent lunch of Yorkshire Pudding, local sausages and gravy, which set the tone for later explorations. Then we spotted something that made our choice to visit Bakewell seem positively inspired. 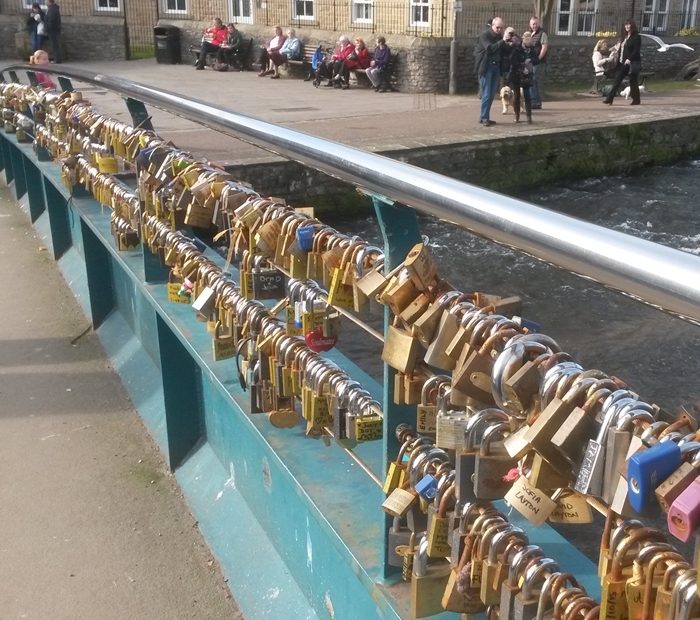 Like Paris, Cologne, Melbourne or Seoul - Bakewell now has a bridge of locks. It's a tradition that seems to have started in Paris when couples added padlocks with their names to a bridge over the river Seine as a token of their love and commitment. As long as the lock stays in place, their love stays strong - which is a bit of a problem for couples who left their locks on the Paris bridge. According to some news reports, the weight of the thousands of locks caused part of the bridge to collapse, and in 2014 the French authorities decided to remove the locks from the bridge rather than risk its total destruction. I'd never known Bakewell to have joined the string of famous love lock bridges around the world… but it was the perfect find for our anniversary. Reading the inscriptions that decorate the locks is as fascinating as wandering an old cemetery and reading the stones. And no, I'm not being morbid. I think you can learn and imagine a lot about a person, the people around them and the time they lived in, by looking at inscriptions on grave stones. On Weir Bridge in Bakewell, it wasn't just lovers who'd left locks. There were many locks placed in memory. Locks that celebrated the life of a father or brother or granddad. There were locks placed as pledges of friendship on the last day of school… and yes, there were pledges made by couples. Did we add a lock of our own to the bridge? Of course we did. The other reason to choose Bakewell as the destination for our day out had to do with food. I'd realised that I didn't have any proper photos of Bakewell's other claim to fame: the Bakewell Pudding. And that was a state that simply couldn't continue. Bakewell Pudding is one of those foods that come with a storybook attached. Legend has it that, in 1860, the cook at the White Horse Inn had a bad day and accidentally added a topping of sugar, eggs and almonds to a strawberry tart. The Taste of Britain, my go-to tome for food-related wisdom, tells me it's a legend, that Bakewell Pudding was first mentioned in 1845 and that - back then - no pastry was involved. Just a thick custard poured over jam or candied peel. A puff pastry base was added later and the layer of jam got thinner. 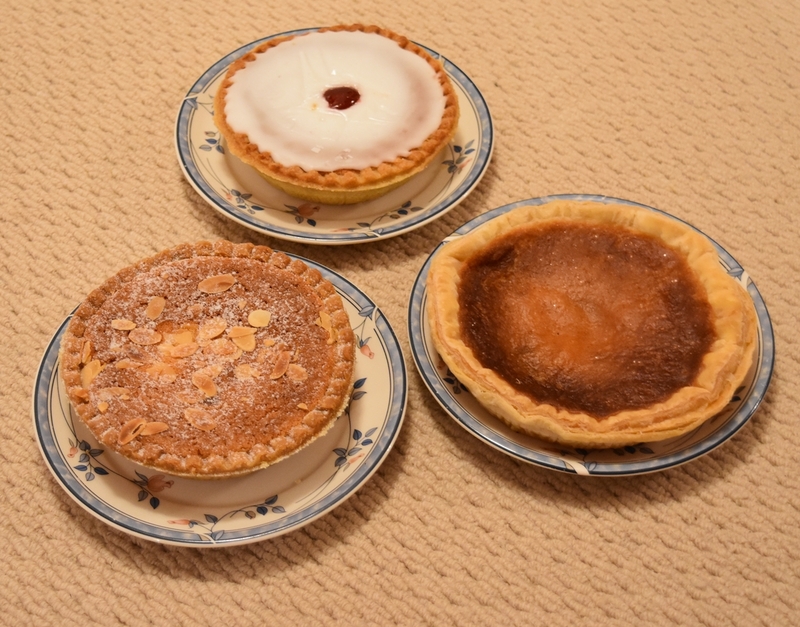 Of course, there are Bakewell tarts, too - and they are easy to spot since they don't use puff pastry for a base. Here's our haul…one pudding, two tarts. We got ours at the Old Original Bakewell Pudding Shop, where they don't just bake and sell Bakewell Pudding, but also the original Iced Bakewell Tart, the almond tart and other tasty goodies. If you're ever in Bakewell, you could join a class learning from the masters how to bake your own. Or, if you'd rather eat than bake, you could post yourself a pudding right from their website. They're not just tasty, they make great gifts, too. And that's it from me for the moment. I'm very much looking forward to one of my favourite events of the year: the start of the English asparagus season on April 23rd. Seeing how chilly it still is, I'm not convinced the green spears will be ready in time, but I'm hoping very much to be proven wrong. If you love asparagus as much as I do, join me next month when I'm planning to share my favourite recipes… and talk a bit about asparagus festivals. Meanwhile, please keep well, and I'll be back next month!